Welcome to our farm's website! We have been raising Miniature Horses here in Central Texas for twenty years. Minis are a delightful and intelligent breed, and we highly recommend the purebred American Miniature Horse for any horse lover. 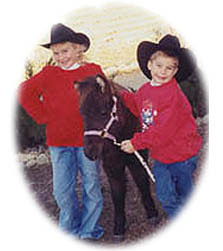 We chose the miniature horse breed because we love horses but don't ride as often as we did when we were younger. Most people don't realize you can do anything with a miniature horse that you can with a big horse except ride. And riding isn't out of the question for small children and grandchildren. We have SERIOUSLY downsized our herd now as we are older and no longer show. We still have our original mare, Robin and two of our best mares that we produced so that we can carry on the Unicorner bloodlines if we choose to do so. Here on our website we have put together some photos and articles about mini horses for your entertainment and to help you understand why they are such a special breed of horse. 12-13-13 Friday the 13th was not unlucky! We sold our three remaining mares that we had for sale AND our gorgeous stallion, Unicorner Rowdy Batman! Thanks to Alexia of Abilene for choosing them! 9-5-13 Thank you, Sonya and family, for purchasing six of our mini girls! We know that Mary, Sera, Sasha, Jessica, April and Donna will do a great job with your youth program! 8-9-13 Thank you, Tammie and daughters, for purchasing three of our mini mares! We know you will enjoy Pinky, Fly and Bangles! August 2013 - We LOVE our visits by our granddaughter! 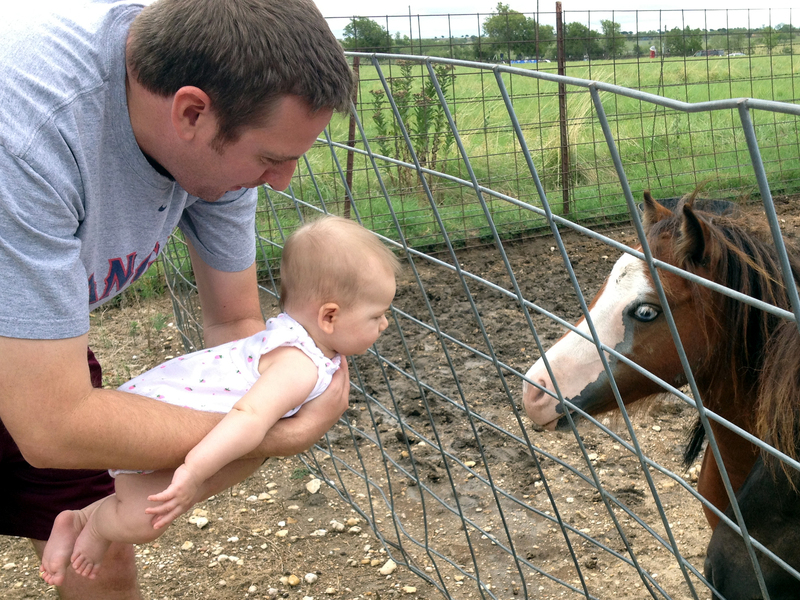 She is starting to take an interest in all the animals on the farm! Yep, that's our girl! But best of all, just love them! Click here to read more about miniature horses and why they are so wonderful! And for more information about the miniature horses of Unicorner Farm click here. Tunis Sheep - A few years ago we decided to add a small flock of purebred sheep to the farm. We chose the beautiful red-faced Tunis, a rare breed that has long roots in American history but had just about become extinct when the American Livestock Breed Conservatory placed them on their endangered list. 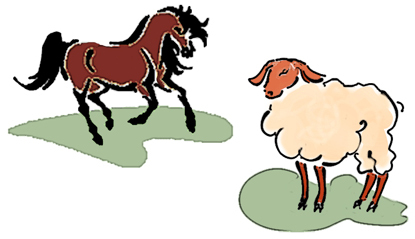 We love the docile temperament of the Tunis sheep and the beautiful Irish Setter red coloring of the lambs. 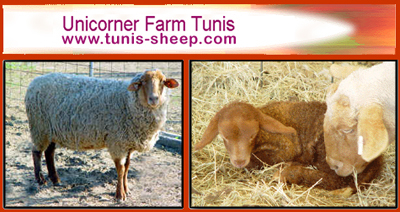 The Tunis excel as multi-purpose sheep, great for homesteading. Cats - The most special residents on the farm are our cats. Even though we no longer breed purebred cats, there will always be some well loved felines on the farm. Debbi is an allbreed judge in The International Cat Association and judges cat shows all around the world. 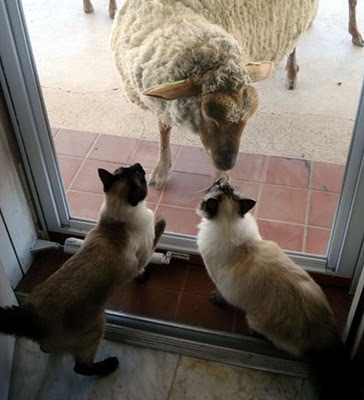 In the house are Bobo and Ellie, shown above meeting a Tunis through the front door. Bobo is half Birman and Ellie is 3/4 Birman, they are from my friend Ann Hoehn's cinnamon point Birman breeding program. Ann raises some of the top Birmans in the U.S. and you can see some of her gorgeous cats on her website at www.BirmanBreeders.com. We also have a beloved outside cat, Inky that patrols the barn and yard for varmints. Guineas - An onslaught of grasshoppers convinced us to obtain some Guinea fowl! We started with some white, then picked up some lavender ones. 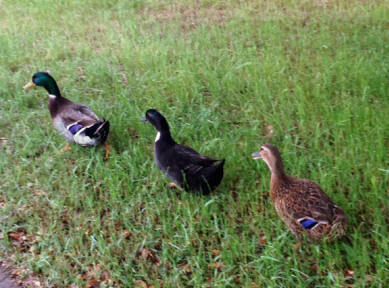 We enjoyed their antics so much we bought some more young ones. 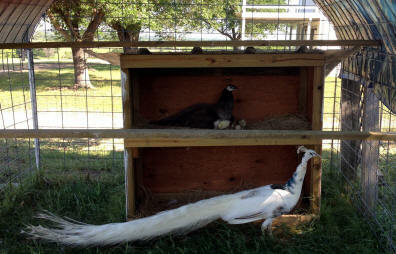 Peafowl - We have a beautiful pair, Nubby the silver pied peacock and his wife, Phenny. They now have six chicks! 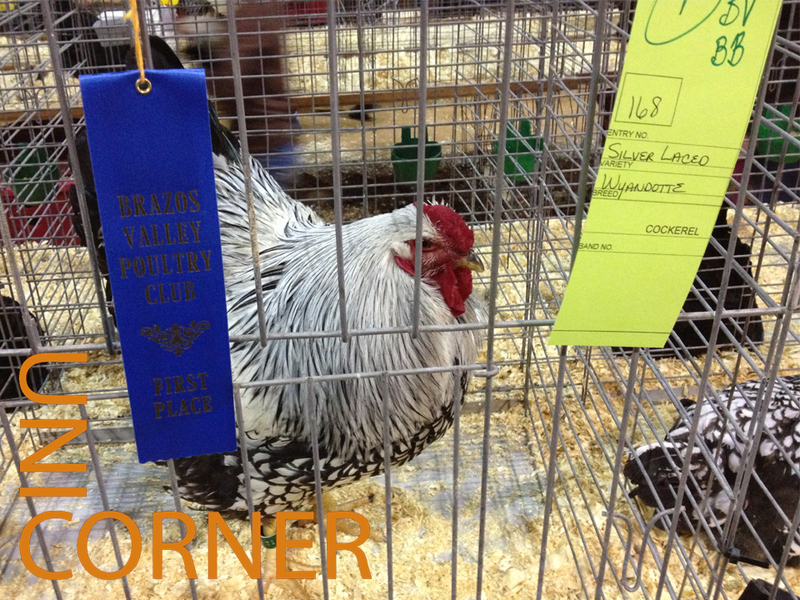 And what would a farm be without CHICKENS! 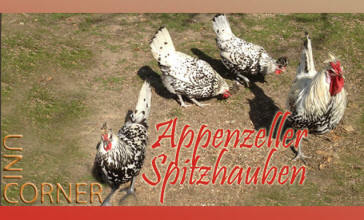 From Silver Laced Wyandottes to tiny Seramas and rare Lemon Cuckoo Orpingtons to super unusual Appenzeller Spitzhaubens and Brabanters. We are now hatching our own chicks and have various breeds of all ages. 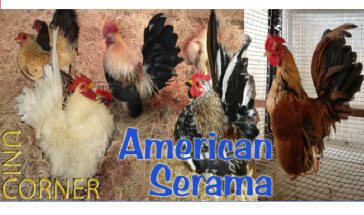 From tiny Seramas to large Silver Laced Wyandotte chicks, we are having a great time discovering the world of chickens! 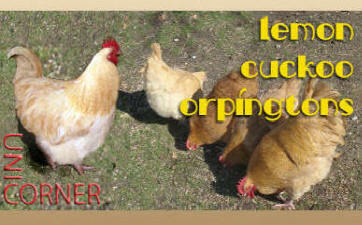 We have fertile hatching eggs for sale as well as chicks! Contact us at 254-715-6815. You can see lots more about our chickens on our website www.BossieBiddies.com or on Facebook with the page by the same name. Thanks for "visiting" Unicorner Farm and please bookmark us and come back often! 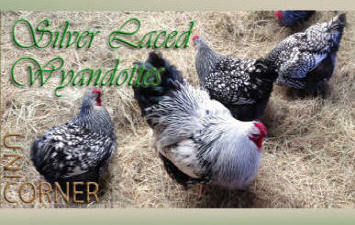 Be sure to Visit Unicorner Farm on Facebook and please "LIKE US"!